The combat mechanics of Blaze of Battle are quite complex and dynamic. To start fighting effectively, you need to construct multiple buildings, train knights, and “hatch” a dragon – in that order, preferably. In other words, you simply can’t “click” on the enemy to start a battle. To understand how all these systems work and to build a balanced army, you can read our guide. Below, we explain everything you need to know about the Blaze of Battle combat mechanics. You need “leaders” to manage both your army and your city. 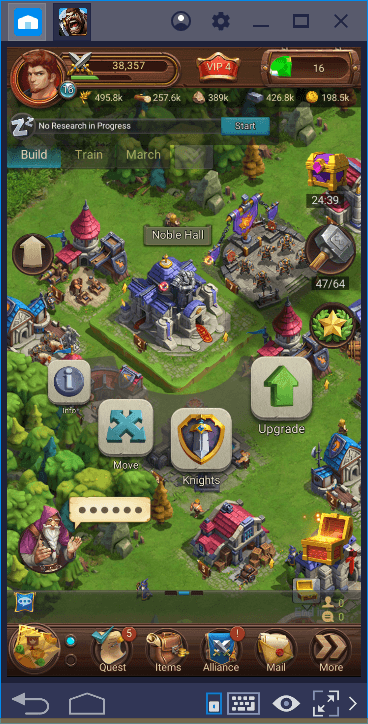 You can use the knights for both: To do this, you first need to build a “Noble Hall”. 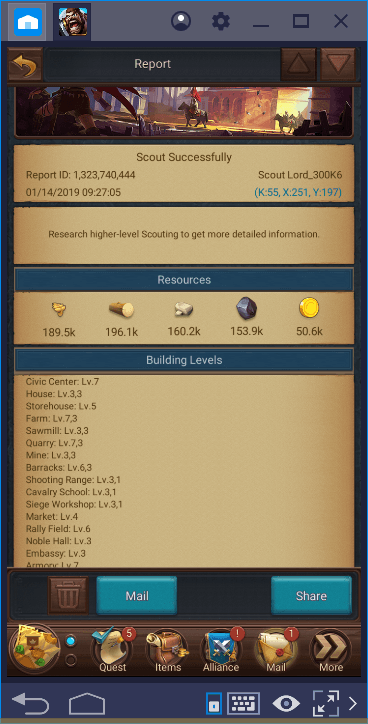 As stated in our guide on buildings, you can upgrade the Noble Hall to level 21. 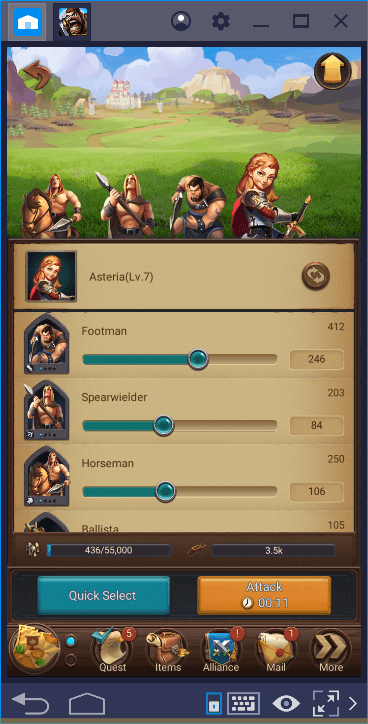 In the beginning, you will only have two knights and these will provide a variety of buffs for your army. However, with each upgrade, you can increase this number and start training knights with the skills needed for city management. 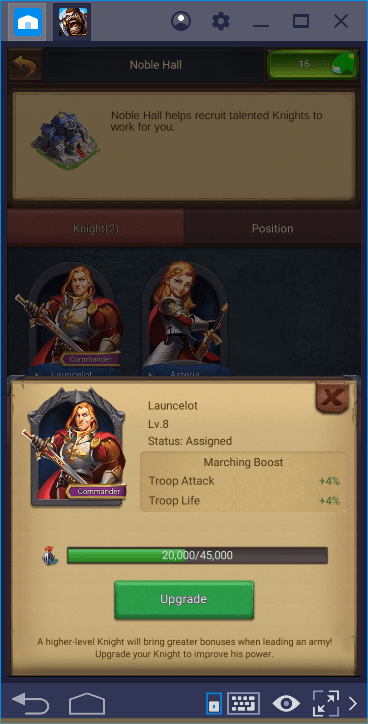 Your first knights will provide various bonuses for troop attack and troop life. By raising the level of knights, you can make these bonuses more effective. 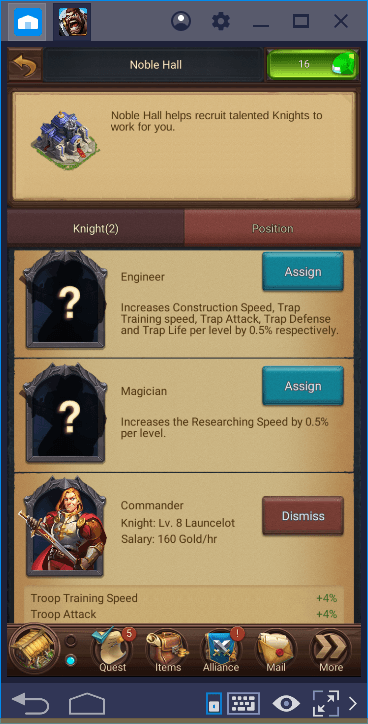 You can assign knights to four different jobs: Logistician, Engineer, Magician, and Commander. Each assigned knight gives you a bonus on a different thing. 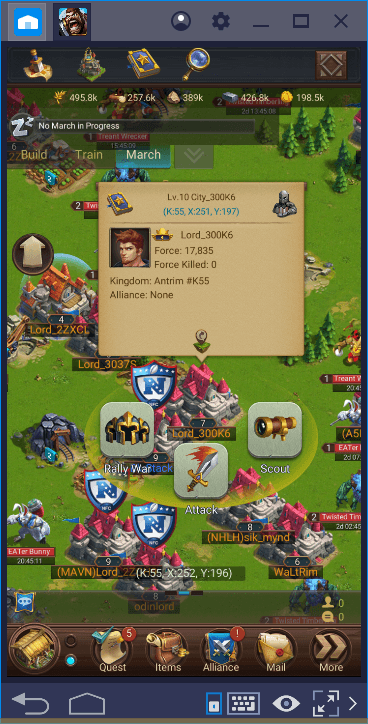 The bonuses provided by your knights will especially help you when you are organizing an attack. For example, suppose you want to attack the kingdom of another player. Start by clicking on the enemy castle and select “scout” first. Don’t forget to scout before attacking. In this way, you can get detailed information about how strong the enemy is. The more you upgrade the scout research in the Mage Tower, the more detailed your report will be. This is the army management screen. Using sliders in the screen image, you can determine how large your attack power will be and which units it will contain. Here we go – we picked our target and started the attack. Our army is moving in real time on the map, so for example, it takes minutes to reach a remote target. 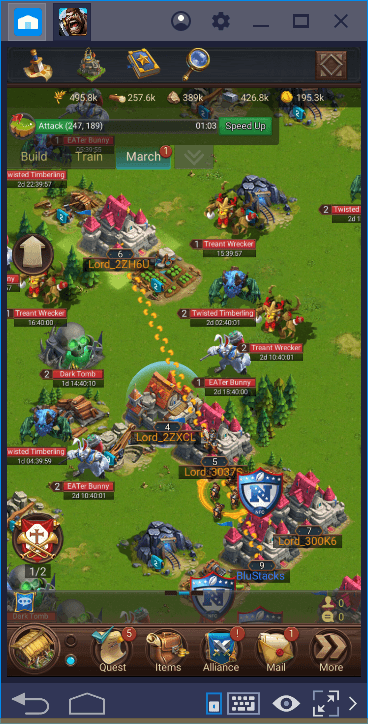 Don’t add all your units to your army and always make sure that some of them remain in your castle. Otherwise, you will be completely vulnerable. This system always works the same way, so there is no difference between attacking an enemy kingdom or a monster. 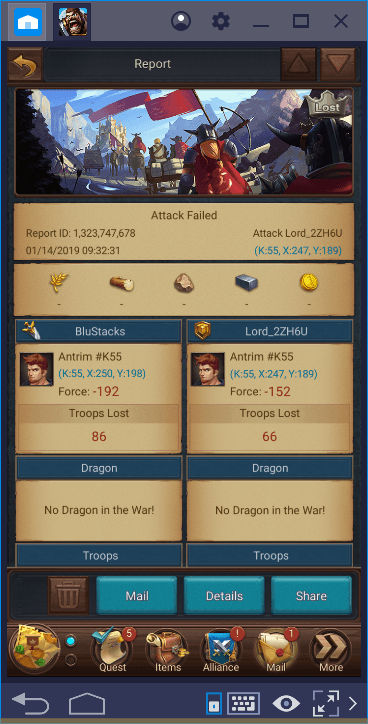 Play Blaze of Battle on BlueStacks 4 Now! If the attack was successful, we would have captured a significant portion of the resources in the enemy city, but we lost. Well, better luck next time. 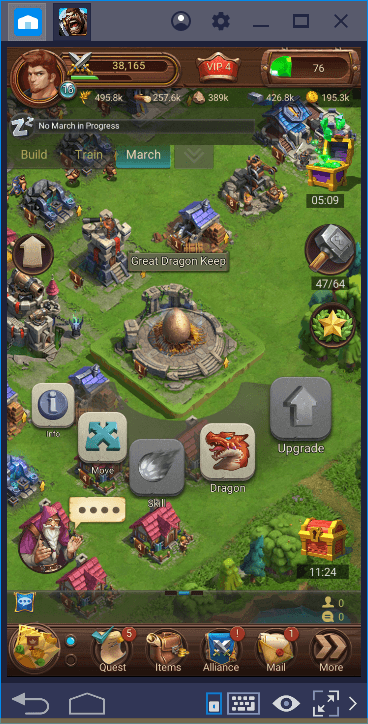 You can think of dragons as support units to join your expeditions on the world map. You can raise them and add them to your army to participate in attacks. Dragons provide your army with different bonuses. You decide what these will be: For example, you can make the dragon give a bonus that increases the marching speed. By doing different dragon skill research, you can get different bonuses. To start, you first need a “Great Dragon Keep”. You need a level 9 Civic Center to construct this building. (You can find detailed information about the buildings in another guide.) To give you an idea, we can say that you can construct a level 9 Civic Center in 4-5 days with a casual play style. Unfortunately, building Dragon Keep is not the only thing you have to do. 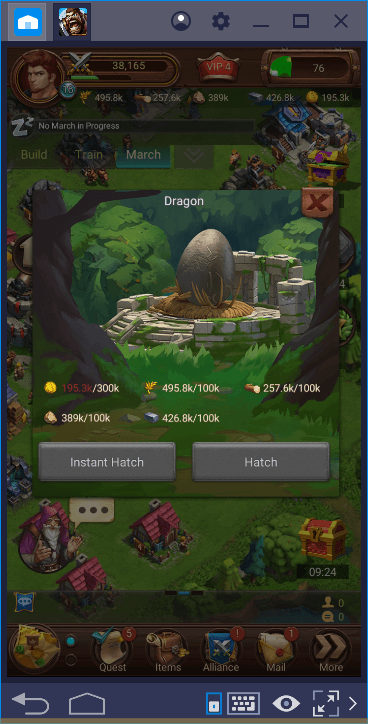 Once the construction is complete, you need a minimum of 300,000 gold to “hatch” a dragon. If you listened to our recommendations and built at least 10 houses, you can have that amount of gold in a few days. In general, it will take about 7-10 days to train a dragon after you start playing, depending on how casual you are. Dragons are not mandatory for battles, but the bonuses they provide are quite useful. Knights and dragons can be important to your army, but there is something more important than them: Troops. Even if you have the most powerful knights and dragons, they will be useless unless you support them with thousands of troops. We can divide the troop types in Blaze of Battle into four basic categories: Siege, mounted troops, ground troops, and ranged troops. First, let’s see which buildings you need to train them. We can also list “Armory” among military buildings, but it just produces units that are necessary to defend your kingdom. In general, we recommend that you construct two buildings from each one: You won’t need more until you reach the mid-game phase. But don’t forget to upgrade every one of them – upgrading military buildings allow you to train more troops. 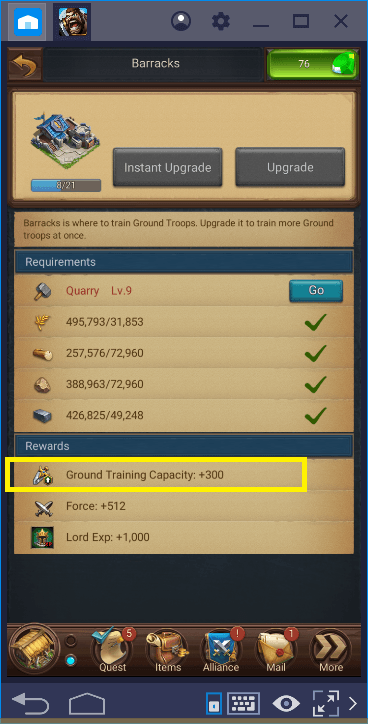 So, you don’t need to construct a new barracks to increase the number of ground units, for example. You can do the same thing by upgrading existing barracks. At the beginning of the game, try to train at least 1,000 of each troop type and gradually increase this number. You must enter the end-game phase with an army of at least one million troops. Ideally, siege units must make up 10% of your army. Each of the other types of troops must have a share of 30%. For example, an army of 1.000 should consist of 100 siege units and 300 of all other units. However, this is not a fixed rule: We have mentioned above that it is important to do scouting before an attack. 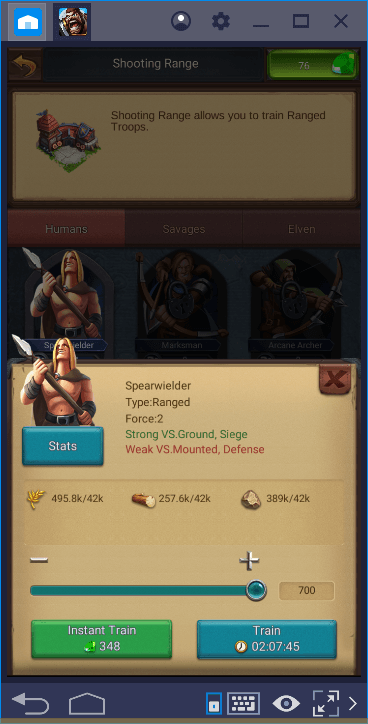 You have to decide which units to add to your army based on the results of the scout report. For example, if the enemy has many ground units, your army should have more ranged units than ever before. In other words, you must dynamically build your army every time and decide which units to place in accordance with the table above. You can find more information on combat mechanics and city management in our other guides. In particular, we recommend reading our Tips & Tricks guide because we share a lot of advice in it. Now, you know what to do on the battlefield: It is time to conquer other kingdoms. Good luck, my lord!